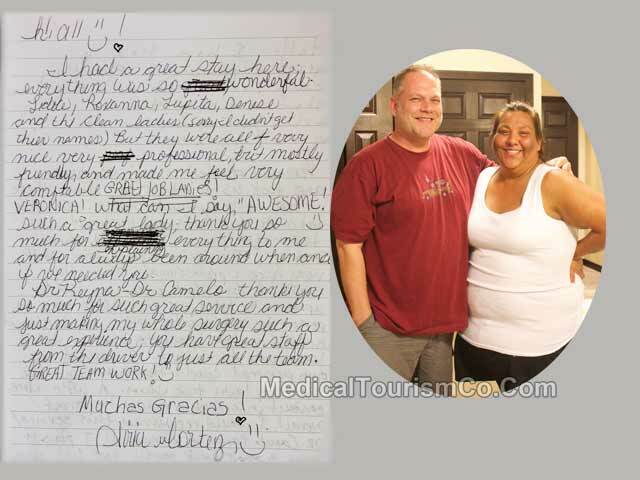 Here is Philadelphia resident Siria Cortez’s written review of gastric sleeve surgery in Mexico. She had her sleeve gastrectomy in Tijuana, a Mexican border city less than 20 miles from San Diego, California. I had a great stay here. Everything was so wonderful. Lidice, Roxanne, Lupita, Denise and the clean ladies (sorry didn’t get their names). But they were all very nice, very professional, but mostly friendly and made me feel very comfortable. Great job ladies! Veronica! What can I say – “Awesome!” Such a great lady; thank you so much for explaining everything to me and for always being around when and if we needed you. Dr. Reyna – Dr. Camelo thank you so much for such a great service and just making my whole surgery such a great experience. You have great staff, from the driver to just all the team. Great team work! Tijuana has been a big draw among people from the United States in search for pocket-friendly gastric sleeve without spending much on traveling. The border town in Mexico is suitably located just about 20 minutes from the international airport in San Diego, CA. Here is the bariatric surgery testimonial of another client of ours who was happy with the communication and services provided to her at the hospital. For a FREE Gastric Sleeve WLS Quote, contact us through the website quote-form on the right.